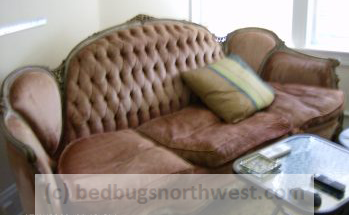 You are here: Home › Bed Bug News › Bed Bugs in Hotels › Packtite Bed Bug Oven › Dealing with bed bugs in your hotel, hostel or air bnb? Worried you had bed bugs in your hotel, hostel, air bnb? Are you traveling this summer? Will you use a plane, taxi, or rideshare? Did you wake up at the hotel with itchy bites? Were you required to put your purse and bags on the floor of the airplane? Unfortunately any travel or vacation increases our risk of encountering bed bugs. If you are worried you might have bed bugs in your hotel room, read on. Getting bites while away from home isn’t the worst thing that can happen. Annoying, creepy and itchy? Yes and Yes and Yes, but the worst case scenario is bringing bed bugs into your car and home. Follow these few tips to feel confident you left any bed bugs behind. Leave your luggage in your garage, basement or deck when you get home, until you can empty it and give it an inspection. It’s a pain but peace of mind is worth it. DO NOT PUT YOUR LUGGAGE, PURSE OR BAGS ON YOUR BED or SOFA. Shake your shoes out before you come in the house (the airplane, don’t even think they don’t have this “problem”. Think about it, everyone, bags on the floor or you just got out of a tax or publicly shared car? Put ALL the clothes you brought and what you are wearing either in the laundry or a plastic trash bag and seal with two twist ties – tight. Best if you can just throw it all – INCLUDING WHAT YOU WORE THAT DAY, in the laundry and turn it on. Take a shower, or bath and change into something comfy. When your luggage is empty – shake it out, then wipe it out with a damp cloth or cleaner and spray and wipe. Get down in the pockets and wipe with a damp paper towel – they love pockets. And I just found out about luggage that heats itself! 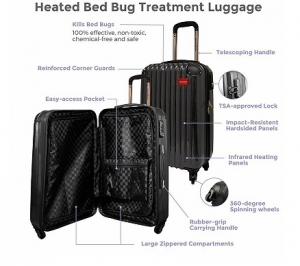 Who knew, read more about bed bug luggage here. If you really want to know you’ve done everything you could do, you can also gently put that luggage in two heavy plastic trash bags and throw in a hot shot pest strip and seal tightly for 10 days. Leave it outside, in the basement or garage. Follow all directions, it’s very easy and it kills bed bugs and bed bug eggs. Remember, bed bug eggs can take approximately 7- 10 days to hatch, so you need to cover hatching time just in case. Do You Want to Avoid Poison to Kill Bed Bugs? No problem. Use Heat! Pop your carryon size luggage and anything else that won’t melt into an effective bed bug oven and let it heat to 120 for a couple hours. You could potentially throw your luggage into a bed bug oven with all your clothes inside if you don’t have make-up or things damaged by heat of 100 or higher. That’s how you check for bed bugs after a vacation without having to be on guard for weeks after returning from travel. And remember many other countries just live with this problem. They often don’t even consider eradication, it’s just part of how things have always been. We can’t change entire cultures, but we can protect ourselves from the horrible beasties.